Drop the aqua, play up the red, pick a neutral to balance all those prints, and I’d love to win the stash buster! Where do you find such adorable prints?! I like the aqua but I feel like a warm yellow would make the quilt feel more cozy. How kind of you to do a giveaway of that great fabric! I like the aqua with the other colors. Maybe you could lighten it up by using Kona white as the background in some of the blocks? Regardless, I think the quilt will look fantastic. I personally wouldn’t do aqua but would sneak some golds in there. 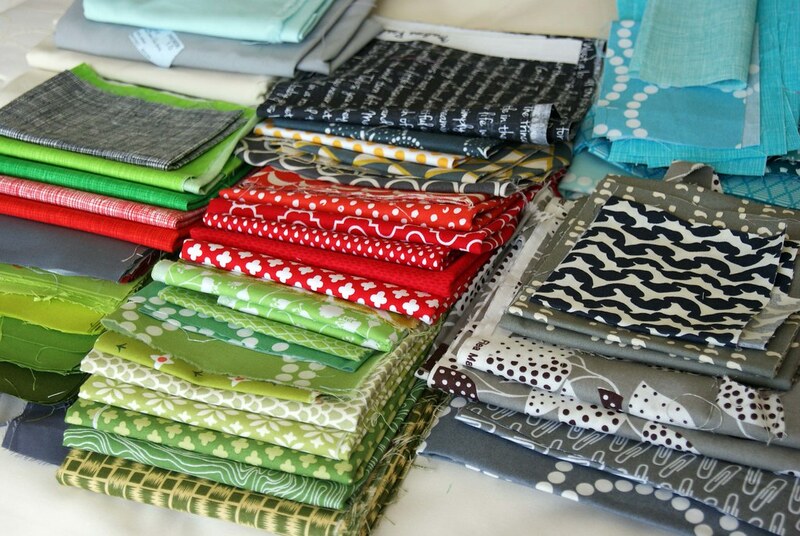 As for solids I am just as terrible as you in ordering and stocking them in my stash… Good Luck, lol. Can’t wait to see this all come together! I like both — with the aqua is overall a very cool color palette though, so maybe it would look great with the yellowy greens played up more instead. Or just go yellow, I think either one could work! Yay, I’m taking this class too! I like the aquas but I think you should just go with your personal preference. As for Konas, apparently the palette builder over at play-crafts.com is soon (as in, later this week) going to have the capability to take a photo and give you the Kona colors, so maybe you could use that coordinating greens and reds. Otherwise I’d go with cool neutrals. I think some Kona Coal would look nice in there. Oh, it is really nice quilt! So, good luck, Laura! Aqua is my fav color and I love that its added to many Christmas lines but in this case I would opt for more a subtle blue (like the solid in the top left) or the quieter soft aquas. I would also add in some golds. Recommending Kona colors is hard via picture. Have you thought of buying a Kona Color Card? A couple thoughts… LOVE the idea of this quilt as a Christmas quilt. I think a lot of the little motifs (like the horse and mitten) could definitely play Christmasy. You probably do need some lighter colored prints or solids for contrast. I sort of like the idea of the aqua because it adds an unexpected element. I’m planning on keeping my stack for this class pretty tentative and then editing as we go. I also love Rachel’s thoughts today. Maybe you could look on pinterest or Flickr for Christmas quilts or art or scenes that inspire you. I’m personally exorcising Kona from my stash because I’m finding I really prefer to have all prints, even if it’s subtle like your sketch fabrics. I absolutely cannot wait to see what you come up with! I really do think Christmas is a great idea. Yes, definitely aquas in!! It will make the quilt not too Christmassy so if you want to use it year round you can – love the colour combos. Can’t help with the Kona’s as I don’t know them well enough. Have fun with your gorgeous new project…..and please post your progress! Can’t wait to see!! I like the aqua, I think it makes the red and green pop. I think I would do more of the sketch, rather than kona. Thanks for the chance. I agree that the aqua works. I don’t know kona so I would do more of the same. I absolutely love the aqua fabrics mixed in! I say keep those! I can’t remember now, but I know I’ve seen aqua mixed into a Christmas quilt and it was lovely. I think kona coal makes every color look great and pop. I really love your Christmas quilt tradition idea! I may have to consider a similar plan in the future. The fabric you chose is awesome! I would keep lists splashes of the aqua and would add similar small golden splashes as well 🙂 can’t wait to see what you come up with! i didn’t even read other comments because i just wanted to say: a bunch more sketch. a bunch more sketch. i LOVE sketch, and it always looks so wonderful in your projects! also, in that picture, i didn’t even see the aqua? i literally had to look three times. BUT, i like it – never would have thought of it, but i dig it. this is such a great idea! i love this. i can’t wait to see this and the sampler quilt will look stunning! also, if you do go kona, i’m obsessed with kona coal. it’s my crush of fabrics. chicopee being my boyfriend. I would leave the Aqua out of the equation, I think that it kind of muddies the water & makes it not so Christmas-y. And I’d opt for more Sketch rather than Kona solids. Good luck with the quilt & hope your family has fun establishing it’s Christmas traditions – I know that a quilt will be a huge part of it. Love all the colors! As I was making our guild challenge quilt with red, light blue, and grey my son said ” nice Christmas quilt” and we don’t even celebrate Christmas! I would most certainly keep the aqua! I love to accent the Christmas Season with Aqua, Cobalt, Purples, and Silver. I love sketch fabrics to add interest…you could do a bit of sketch and solids depending on the balance. I would go yellow with the green but I do love the aqua with the red. White, Snow, Ivory, Oyster, Bone, Putty, Parchment, Biscuit, Raffia, Ash, Iron. What a lovely idea to establish a Christmas tradition with a quilt. Here in New Zealand it will be summer then so I couldn’t do that. I like the aqua with the red and green – you may find that just by a dding a little yellow it makes all the other colours pop and your quilt have that WOW factor. Fabric choices are the hardest part of making a quilt i think. Good luck and thanks for the chance to win some fabrics. I think Golden Yellow would be beautiful with this pallet but the Aqua would be stunning. I would totally use the Sketch prints in the colors you chose. They’re great! Personally, if I were going to use the red and green, I would leave out the aqua, but, personally I’m not really fond of the red and green Christmas colours. For you it might be white, if it snows, light blues for frost and ice, yellows for decorations and warm hugs, or whatever else it is that reminds you of Christmas with your family. I didn’t notice the aqua in your picture at first. My knee jerk reaction was to say that aqua is more of a summery color, but then ice = winter = aqua so it would be nice. I think if you are going to go with solids, I’d go with sketch instead, and I wouldn’t go so much with the grass green (that makes me think of spring) but instead the lime/bright green, clear reds, etc. Just my $.02. I love the idea of a Christmas quilt, btw. My kids are 19 & 23 and remember every detail of our holiday traditions and must have Christmas story books read to them (still!) on Christmas Eve, get Christmas PJs, etc. It’s so nice to start early with those traditions. Laura, your blog is so refreshing. Today you had me at “you’d know you were home when you saw the quilt.” Way to pull on the heartstrings, lady! I love the traditions of winter: the lights, the sounds, the tastes, the comforts and cheer. The magic as the days grow darker and we all go inward finding a place to be warm. Ah, but I digress. I love the idea of this quilt. I love that your family will have this special quilt to mark the season. May I borrow this idea for my own little family? Now to your questions: I personally like the aqua with the reds and greens and greys. It adds a nice little punch of color and would looks great as an accent scattered throughout. I think a few solids would be great too – but I don’t have my Kona color card in front on me. Do you want to borrow it? I could send it to you if you’d like (uh, just as long as I get it back. :). Also, which sampler class did you sign up for? This looks like a great way to work on some skills that I have yet to try! I think leave the aquas in! 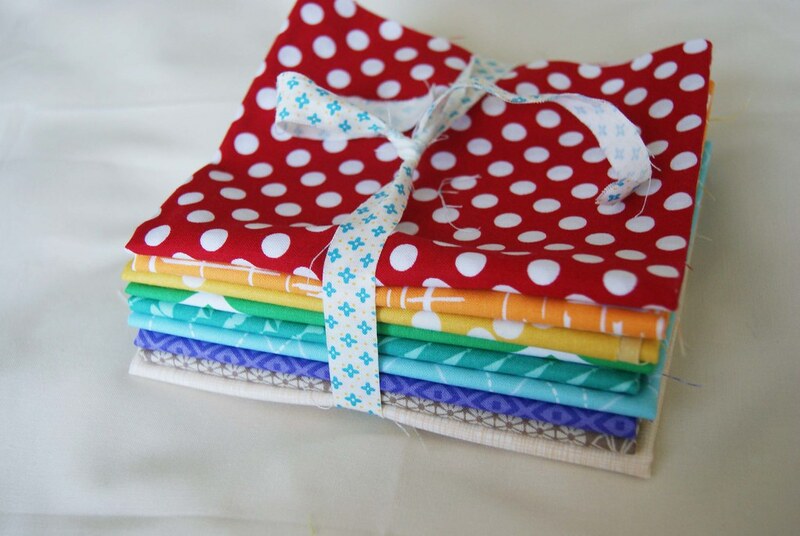 I also think that a Christmas quilt that is primarily aquas, reds and grays would be gorgeous….just a thought. Love the sketch & like the idea of skipping Konas for this quilt all together. Fun!!!! I love the idea of having some festive handmade holiday things that only come out once a year and I think Penny Sampler will make a great holiday quilt. Love your fabric choices, especially the greens. I don’t think the aqua would be too much at all. Laurie Wisbrun’s Brrrr polar bear-themed holiday line uses red, green, and teal as the main colors (and is also super fun because polar bears!). I’m planning on making some QAYG stockings sometime this summer. Thanks for the giveaway! I’d save the aqua for another project. There are some great yellows on the second Column – maybe play them up a bit. I do love the sketch prints, but a quilt with some strong solids does pack a punch. Maybe some Kona Steel, Snow, Carbon, or even (gasp!) black. Happy quilting! Can’t wait to see how this turns out! I think I would add a bit more red and then go with the golden yellow. To me the aqua isn’t quite Christmas-y with the green already there. Aqua in place of green I would like, but not both. Hope this helps. Thanks for the chance to win! I like the aqua but I say take it out and add gold. To me there’s something romantic about metallics at the holidays. I like the aqua, I also love Sketch! Have you seen Wishes by Newcastle fabric? They have combined aqua with cream, coral and lime. Why buy solids! I love the aqua with the Christmas colors! As for the Kona, I think you can never go wrong with white and coal but I realize that those are not very adventurous choices 🙂 The green sketch would be lovely too – it will be hard to go wrong with this quilt! Yes on the aqua! I love a little bit of aqua in Christmas quilts…it brings the winter feeling in for me. I don’t have such strong feelings on the solids. You seem to have more greens than red, so maybe more of that (cardinal? I don’t know what would go with your other reds). Maybe some more white too…white is classic Christmas color. You could get some snow from Kona! Or maybe sky if you want to be really daring. Hi, I would keep the aqua for sure maybe not so many different colors of green. I say at least one solid for each main fabric, but I am a solids fan. Look here to see what you like http://www.robertkaufman.com/fabrics/kona_cotton/ that is what I did before my color card. Don’t expect it to be only used at Christmas my daughter goes and gets ours anytime she is here no matter what is out! Good luck! I will love to see what you do with this quilt! Thanks for the giveaway! Personally, I love aqua in Christmas quilts. I also love the pink/red/lime green christmas projects as well. I’m excited to see what you come up with! I don’t think I’d replace the aqua with yellow…when I look at the other fabrics/colors you’ve selected I already see enough blending going on and I think yellow would just blend in. If you like aqua (i do!) it would make for nice pops of color sprinkled throughout the quilt. You’ll probably see your color and style choices change as the years go by…I know mine sure have. I’m so with you on making some Christmas traditions for your family. We only have one son and all his life we always went to the grandparent’s house for every holiday…I had no wiggle room at all…now his granddad just passed away and grandmom is not doing too well either. I wonder if he is going to really struggle with holidays because going to their house may no longer be what we do. There is probably value in doing different things as the years go by. I like the idea of aqua in a Christmas quilt. It seems soothing and sort of seasonal in a classy way. The penny sampler seems like the perfect way to incorporate a little bit of aqua into some Christmasy traditional colors. I can’t think of the Kona colors off the top of my head, but I love lime green with my reds for Christmas stuff I have made in the past. I usually use snow for everything (creature of habit). I like the idea of picking bright traditional Christmas solids and incorporating them into this pretty scrappy collections. Was that vague enough? Hope it helps and I can’t wait to see your progress!